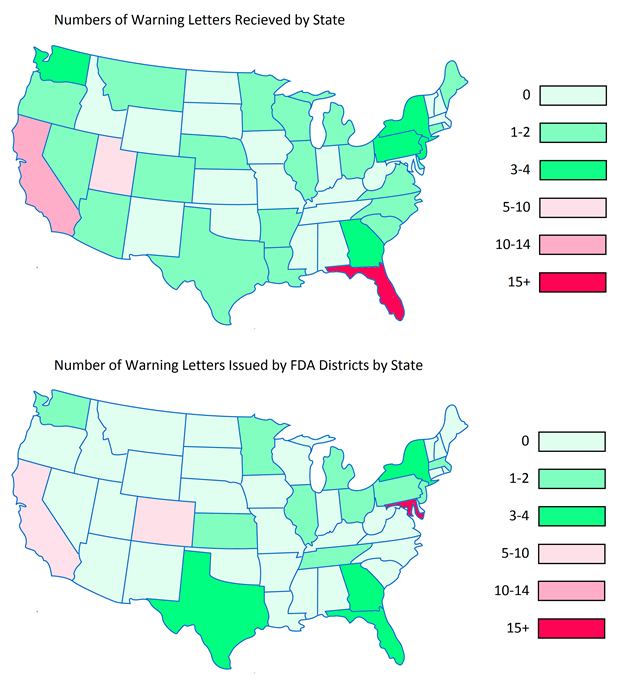 In 2015, the FDA issued 80 Warning Letters (WLs) to dietary supplement (DS) companies. This was a 12.68% increase on the 71 issued in 2014. The increase can in part be attributed to the large number of WLs issued to companies marketing products adulterated with non-dietary ingredients such as beta-methylphenethylamine (BMPEA) and 1,3-dimethylbutylamine (DMBA). Because many of the WLs sent were for the non-dietary ingredient violations, and inspections for those products generally involved review of the labels for ingredients, inspection types categorized as ‘labels’ were significantly higher than other categories in 2015. This did not equate to a proportionally high number of WLs citing label violations. 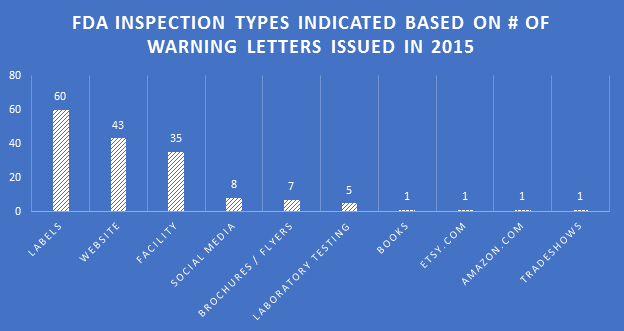 Inspection types resulting in WLs expanded in 2015. Social media sites have been receiving more scrutiny. The FDA is also looking for claims on online retail sites where companies are marketing DSs, such as Etsy and Amazon. Below are heat maps of the continental Unites States showing the prevalence of WLs received by DS companies by State, as well as which States they were sent from. In 2015, companies in Florida, California, and Utah received the most WLs. The FDA tended to send the most WLs out of the District Offices located in Maryland, California, and Colorado. 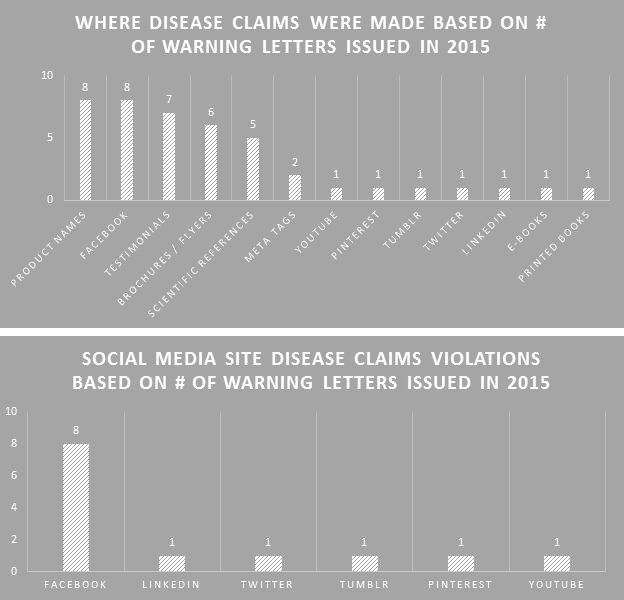 Disease claims were the most cited violation in WLs for 2015. Non-dietary ingredient adulteration violations were in a distant second place due to some crackdowns on particular ingredients. 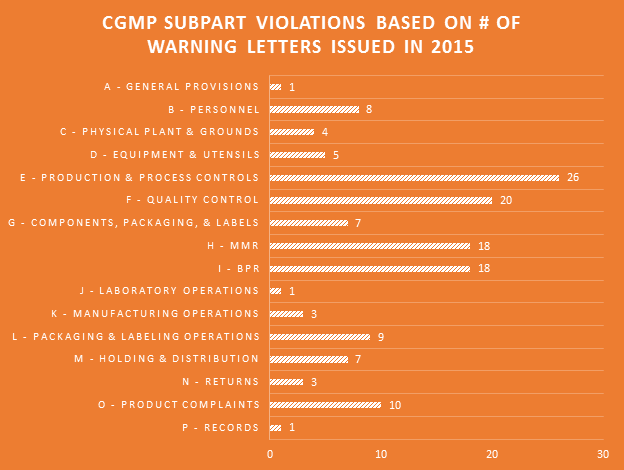 Violations in current Good Manufacturing Practices (cGMPs) and labels were cited in more than 20 WLs each, indicating continued challenges for companies in both areas. The FDA cited disease claims violations from a variety of places, demonstrating their increasing concern about what companies are saying and where they are saying it. Product names that were disease claims topped the list along with disease claims made on Facebook. New areas in 2015 include e-books, LinkedIn, and Tumblr. Not much changed in 2015 from previous years in terms of the types of disease claims marketers are illegally using. The top 15 should be no surprise. Combinations of many of these showed up in several of the WLs. The FDA generally only cites disease claims violations in WLs that are clearly explicit. Violations of every Subpart of the cGMP regulations were cited in the 2015 WLs. Production & process controls and quality control Subparts saw the most violations. Companies failing to have adequate master manufacturing records (MMRs) and batch production records (BPRs) continues to be a major problem. 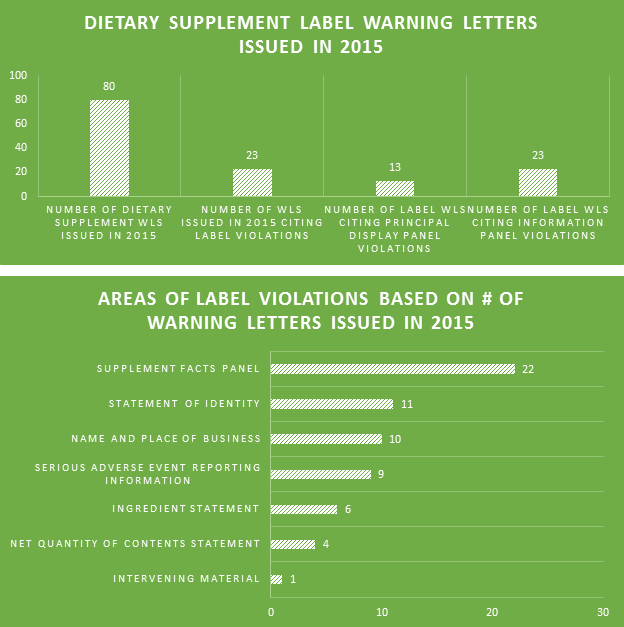 Of the 80 DS WLs issued in 2015, nearly 30% of them cited violations for product labels. This number is likely deceivingly low because so many of the non-dietary ingredient WLs seemingly failed to also cite label violations for the offending products. All 23 WLs citing label violations highlighted errors within the information panels; only 13 involved errors within the principal display panels. One of the biggest label violations of 2015 involved matching the label’s recommended usage of the product to the declared Serving Size. 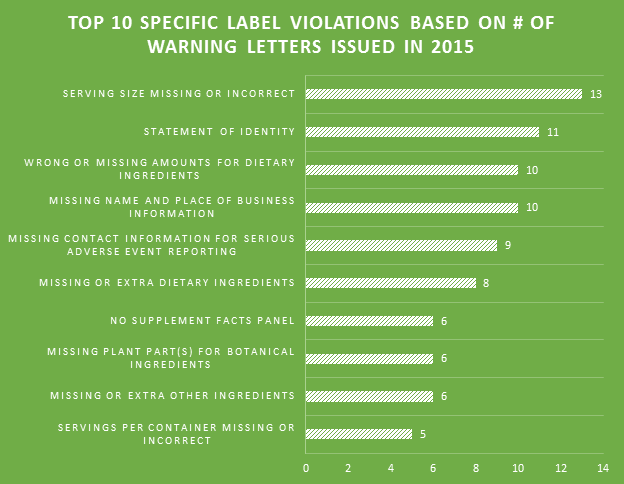 The majority of the top 10 violations were made within Supplement Facts panels. Failing to include proper contact information for the reporting of serious adverse events associated with product use is a prevalent problem among labels. Note: All information in this article was derived in good faith and is believed to be accurate. Data was collected from all 2015 FDA Warning Letters issued to dietary supplement companies posted on the FDA’s website as of February 3, 2016. Communicating the features and benefits of your dietary supplements is a critical success factor. Although this can be done in several ways, the most powerful is usually through the use of structure/function claims. A common misnomer about these claims is that virtually anything can be said as long as the FDA disclaimer language is added to the label or labeling. Unfortunately, this is far from the truth. There are regulations that put significant limitations on what can be said, and it is truly an art to not only saying things compliantly, but also in ways that are meaningful to consumers. Here are some of the most basic aspects of structure/function claims. Structure/function claims describe the role of a nutrient or dietary ingredient intended to affect the structure or function of humans, or characterize the documented mechanism(s) of action by which a nutrient or dietary ingredient acts to maintain such structure or function. Importantly, they cannot be disease claims. Structure/function claims may also relate to nutrient deficiency diseases, or describe the effect of the dietary supplement on general well-being. 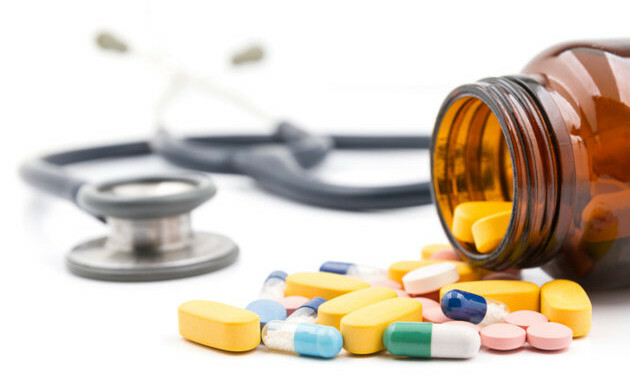 Dietary supplements and their ingredients cannot be marketed with the intentions to diagnose, mitigate, treat, cure, or prevent diseases (other than classical nutrient deficiency diseases). Doing so creates disease claims. By the definition given in 21 U.S.C. 343(r)(6), “disease” is damage to an organ, part, structure, or system of the body such that it does not function properly (e.g., cardiovascular disease), or a state of health leading to such dysfunctioning (e.g., hypertension); except that diseases resulting from essential nutrient deficiencies (e.g., scurvy, pellagra) are not included in this definition. Q: Which of the following is the disease claim? 1) Product X treats diabetes. 2) Product X promotes healthier blood sugar. A: Both are very likely to be considered disease claims. Did you choose 1? Disease claims can be explicit or implied. They need not mention specific disease names such as diabetes. 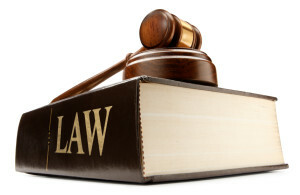 What laws and regulations govern structure/function claims? The Dietary Supplement Health and Education Act of 1994 (DSHEA) added section 403(r)(6) to the Federal Food, Drug, and Cosmetic Act (FD&C Act). This section of the law states that a dietary supplement may bear structure/function claims and provides their requirements. Further, 21 CFR 101.93 also restates these requirements. What are the requirements for using structure/function claims? 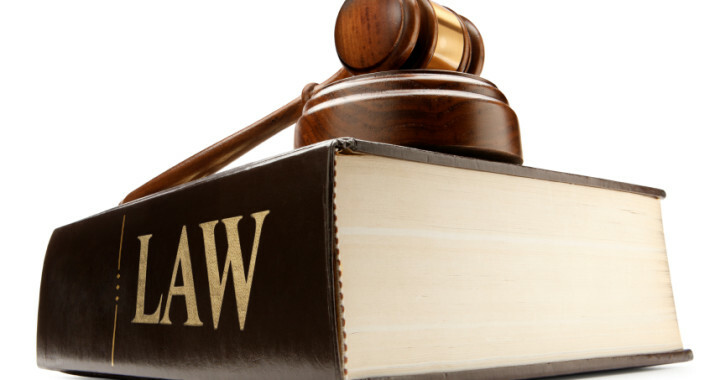 You must have substantiation that the claims are truthful and not misleading, and you must have this substantiation before you make the claims. Refer to the FDA and FTC guidance documents for preparing competent and reliable claims substantiation, or get help from someone who can prepare these files for you. You do not want to be caught without them. You must notify the FDA that you are using the claims within 30 days of first marketing your product. Q: Do you really need to do this? A: Yes. Many companies overlook this important requirement for making structure/function claims. You must include the mandatory disclaimer for structure/function claims. Text for the disclaimer when one claim is present: This statement has not been evaluated by the Food and Drug Administration. This product is not intended to diagnose, treat, cure, or prevent any disease. Text for the disclaimer when more than one claim is present: These statements have not been evaluated by the Food and Drug Administration. This product is not intended to diagnose, treat, cure, or prevent any disease. The disclaimer must be placed adjacent to the claim(s) with no intervening material or linked with a symbol (e.g., an asterisk) at the end of each claim that refers to a symbol placed adjacent to the disclaimer. On product labels and labeling, the disclaimer must appear on each panel or page where structure/function claims are made. The disclaimer must be set off in a hairline box when it is not adjacent to the claim(s). The disclaimer must be in bold type and no smaller than one-sixteenth inch. While these basics do not cover everything you must know when making structure/function claims, they give you a good start towards regulatory compliance. For a bit more, see our April, 2015 article Supplements Claimed to Treat 100+ Diseases. It highlights some places claims exist, as well as some of the most prevalent claims cited in FDA Warning Letters. Many professions require continuing education to keep the professionals in those fields abreast of the trends and evolving research. 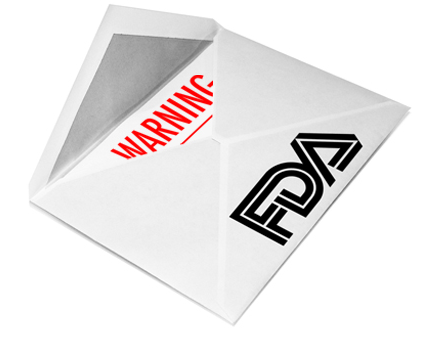 For us that are involved in dietary supplement regulatory affairs, one of the best unofficial methods of continuing education comes in the form of FDA Warning Letters. 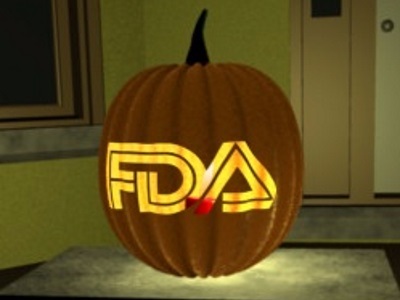 A careful reading of these each week not only reminds us of the regulations, but shows us how the FDA is interpreting them, and which issues might be on their radar. In addition, when we are suggesting that our companies or client’s make changes to their manufacturing practices, labels, claims, etc., it can be easier at times to get buy-in when not only the regulations, but also one or more recent FDA Warning Letters can be brought to the discussion table to demonstrate the needs and the associated risks. What rounding rules must I use for expressing the % DV? So why is any of this important? Because the labeling regulations and FDA guidance say that the Daily Value percentages used on the labels above should be rounded to the nearest whole percent, as they appear to have been. However, the FDA Warning Letter was holding them to the rounding used for conventional foods. And if you are a label reviewer that has been doing it one way or the other, this FDA Warning Letter might have led you to believe you have been doing it incorrectly, or worse, reinforced your incorrect rounding. Because we review hundreds of labels each year, getting the issue clarified was extremely important. Even though it clearly looked like a mistake on the FDA’s part, there is too much on the line to make that assumption. As such, we sent a letter to the FDA District Office with the question. Although it took a few weeks to get a response, their re-review recognized the error. So if you happened to have had a feeling of déjà vu when you again saw the New Dawn Nutrition, Inc. FDA Warning Letter in late September, it was because it was amended to not include the Daily Value rounding violations and reposted on the FDA’s website. In the end, all is fixed. Anyone that felt their stomachs drop or lost nights of sleep thinking that all of their Daily Value percent declarations were off can rest knowing that it was all just a minor mistake. There are so many label regulations to keep track of, so it is understandable. 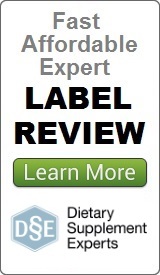 At Dietary Supplement Experts, we appreciate the FDA’s swift recognition and correction. If you are interested, the link to the amended FDA Warning Letter is at http://www.fda.gov/ICECI/EnforcementActions/WarningLetters/2015/ucm458141.htm. In addition to the above item of interest, this one is very insightful on cGMP issues, misuse of the FDA logo, proper units of measure, and the findings of the FDA analysis of some of the products will make you wonder how those violations were not in the mainstream news. This month’s article highlights five mistakes in label compliance that we commonly see in our dietary supplement label reviews. A tell-tale sign of label design plagiarism is when the label appears to be a hybrid of compliance and non-compliance. Sometimes this is in the form of a nutrition label that says “Supplement Facts” across the top, but then has the design elements for conventional foods. Other times, some label components are very compliant, while others indicate a clear lack of knowledge of the labeling regulations. No matter what the issues are, the bottom line is that copying someone else’s label to create your own is a very bad practice. You never know how well the other company understood the regulations, or to what level they complied with them. Your interpretation of their label as it applies to yours will probably even create further problems. When your labels are up for reprinting, it is a great time to send them through the review process with someone knowledgeable about the regulations. If changes must be made for better compliance, do not resist. 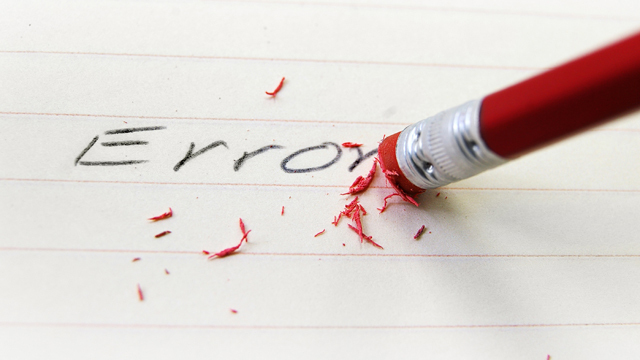 Just because errors have been made for long periods of time without detection, it does not mean that they are any more correct. If a claim is being made that should not be made, or a Serving Size has been wrongly declared, correct it as soon as possible. Marketing messages and formulations can be adjusted with some creativity. The labeling regulations are far less flexible. Making the assumption that certain aspects of label compliance are lower risk or lower priority than others can be a huge mistake. Many times in our label reviews, clients might not see the purpose of our requested changes, or opt not to make them with their own assessment that the requests are low risk. Our explanation is first the regulations that require the change, and second the fact that the FDA’s label inspections have been increasingly technical over the years, as evidenced by Warning Letters citing seemingly minor violations. Having a Warning Letter come up on the internet when people search for your company is not worth the risk of maintaining label problems for no good reason. Not to mention the growing number of clients we are getting that have their products detained at the borders because of very minor violations. This we see a lot. Sometimes it is because the company was not aware of the proper units of measure to use for declaring ingredient amounts; other times it is because they wanted things to appear better on their label. In most cases, when our review finds that something declared in mg, for example, needs to be declares in g, we are met with some reluctance. The company usually does not want to go from declaring 1,500 mg of an ingredient to 1.5 g, even though that is what the regulations might require. Like the mistake above, maintaining something like this might seem minor and low risk, but could find its way into a Warning Letter or cause a shipment to be detained at a border. Update: The old label regulations read, “These amounts shall be expressed using metric measures in appropriate units (i.e., 1,000 or more units shall be declared in the next higher set of units, e.g., 1,000 mg shall be declared as 1.1 g).” The new label regulations remove the example language, and now only reads, “These amounts shall be expressed using metric measures in appropriate units.” Time will tell how the enforcement will change. “Zero claims” are essentially claims made in the Supplement Facts panel that show an ingredient is present at a value of zero (e.g., Total Fat 0 g). These find their way onto labels for many reasons. Sometimes it is label plagiarism, many times it is marketing, and other times companies feel it is required. On conventional food labels, there are requirements for making zero claims. However, on dietary supplement labels, you are not allowed. If you have zeros under your Amount Per Serving heading, they must be removed. Hopefully none of these frightening mistakes are ones that you are currently making. If you are, it would be worth reviewing them at your next label printings or sooner. Keep in mind that these are just a slim fraction of what we see on a regular basis. If you have questions or need full label review, please contact us anytime. 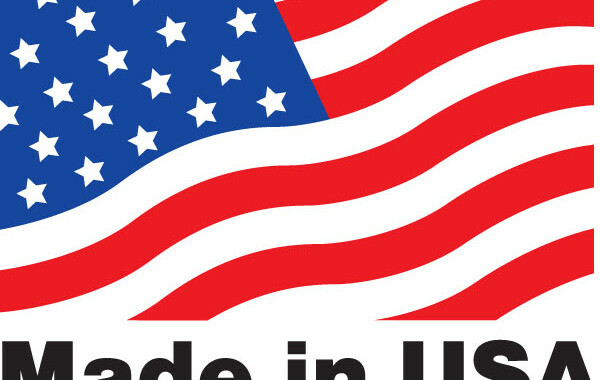 If you are currently using “Made in USA” claims, either explicitly or by implication with the use of images such as the U.S. flag or map, it might be a good time to review them. Recently, a number of companies have been targeted in California-based lawsuits for non-compliance and potentially misleading consumers. The FTC has a guide for complying with what is referred to as the “all or virtually all” standard. 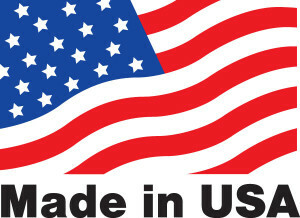 The standard basically requires that all or virtually all of the parts or processing that go into a product must be of U.S. origin – it should contain no or negligible foreign content. You will notice that California does not have the same “all or virtually all” standard. Since many dietary supplements contain ingredients of foreign origin, qualified claims are commonly used per the FTC standard. 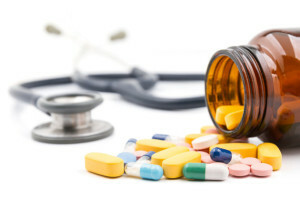 If your dietary supplements are sold in the State of California, and you currently use any sort of Made in USA claims – explicit or qualified – a close read of the regulation above and review of your labels might be wise to determine you own level of compliance. 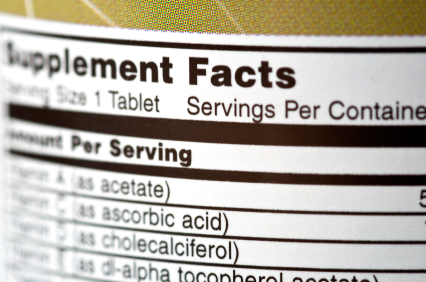 Will Your Supplement Facts Panels Require Changes Soon? The final rules resulting from the FDA proposed changes to nutrition labels, including the Supplement Facts panel, will become effective 60 days after publication in the Federal Register. January 1, 2018 will be the uniform compliance date, provided that the regulations are issued as expected in 2016. Although this timeline sounds long, it really is not. Labels will need to be evaluated for needing changes. Current labels will need to be depleted. Changed labels will need new design work and reprinting. Although the changes that will occur can only be speculated on right now based on the proposals, doing an early self-audit can give you a rough estimate of how extensive your changes may be. Here are five questions you should be asking right now. If you can answer “yes” to one or more for a label, it is possible that it will require changes. Do you currently declare any of the following? Does your product contain sugars that are either added as ingredients during processing or are finished products; this includes sugars (free, mono-, and disaccharides, syrups, naturally-occurring and concentrated sugars isolated from a whole food (e.g., fruit juice concentrates)), or other caloric sweeteners? Does your label currently not declare vitamin D or potassium, but contain more than 0.4 mcg (16 IU) vitamin D or 5 mg potassium per serving? Does your label include nutrition information or recommendations for subpopulations such as infants, pregnant or nursing women, or children? 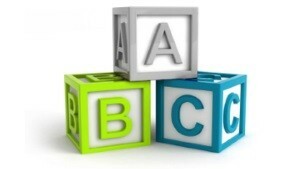 Are you using nutrient content claims or health claims? Answering “yes” to question #1 will probably result in the most label changes. There is also a possibility that the footnotes and/or formatting could see revisions that could produce much more sweeping changes. The FDA posted a new Warning Letter on their site today. The recipient was Yummy Earth Inc., located in New Jersey. It was instantly interesting because this is the second week in a row that the FDA has cited violations for misusing “healthy” nutrient content claims. This new beginning trend started with last week’s letter to KIND, LLC, which has received a considerable amount of attention in the press. However, there was another interesting violation cited in the Yummy Earth Warning Letter. The company was making an implied nutrient content claim for the amount of vitamin C contained in their YumEarth Organics organic pops. The FDA went on to explain that the ascorbic acid added to their product was not consistent with the fortification policy in 21 CFR 140.20, which states that the FDA does not consider the fortification of snack foods such as candies appropriate. In another recent warning letter of sorts, the New York Attorney General’s Office sent a letter to Snap Infusion LLC, in Massachusetts, who markets a vitamin-infused snack called SmartCandy. Although NYAG’s office had multiple serious concerns about this product, 21 CFR 140.20 was again cited. Nutrient content claims were also being made here for several vitamins. An observation commonly noted in FDA Warning Letters to dietary supplement companies is the use of a shelf life date, with an assumed lack of data which supports that date. At first glance this appears to be a legitimate requirement. However, when reviewing the Part 111 Final Rule and other statements made by the FDA, a conflict quickly arises. Did you know that a store can sell food past the expiration date? With the exception of infant formula, the laws that the Food and Drug Administration (FDA) administers do not preclude the sale of food that is past the expiration date indicated on the label. FDA does not require food firms to place “expired by”, “use by” or “best before” dates on food products. This information is entirely at the discretion of the manufacturer. 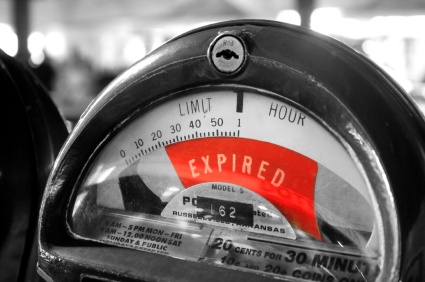 Does the DS CGMP rule require me to establish an “expiration date” (or a “shelf date” or “best if used by” date)? It is important to recognize that neither shelf life dates for foods, nor data which supports a shelf life date is required. And, they are not mutually exclusive, i.e. you can have one without the other. This is evident for two reasons. Firstly, the Part 111 Final Rule and cGMPs define the word “Must” as a requirement. If data to support a shelf life date were required, “Must” (requirement) would be used instead of “Should” (which denotes a preference). Secondly, the Part 111 cGMPs and FD&C Act do not explicitly state a company must have data which supports a product’s shelf life date. The only mention of shelf life dates is in reference to the length of time reserve samples must be held (111.83, 465 & 605). This is the reason shelf life date observations are always at the end of a warning letter and never included in the formal citations found in the body of the letter. The observation is an expectation which is different from an enforceable regulation. Naturally, having a shelf life date supported by data is always preferred. However, companies are not required to meet FDA preferences, only the requirements stated in the Part 111 regulations and the distribution of safe product. If the FDA wants to require shelf life dates to be supported by data, then they must change the regulations. I am not sure how many times over the years I have heard dietary supplement industry problems explained away as rare situations involving “bad actors” or a “few bad apples”. Of course these expressions are coming from those within the industry. And although it might be easy to sort of mindlessly accept the notion that the vast majority of dietary supplement companies are in full compliance with the regulations, it may not be realistic. That is not to say all non-compliances exist intentionally, but the industry certainly has more bad apples than many of us care to admit. One easy way to support this assertion is to look at the Warning Letters sent to dietary supplement companies. 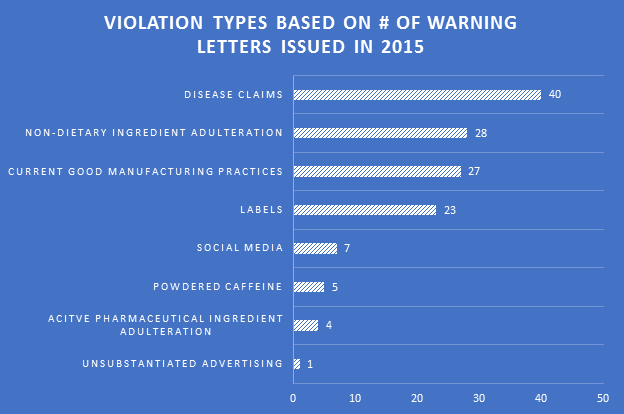 Looking at just the most prevalent violation type by number of Warning Letters issued, which is for products being claimed to treat or cure disease (unapproved new drugs), it does not take much to see a major problem. Of the 19 Letters issued to dietary supplement companies so far in 2015 – which is a lot at this point – 18 were going too far with their claims. Now if you were not taken aback by 18 companies marketing their dietary supplements in ways that cause them to be viewed by the FDA as unapproved new drugs, and seeing the number of places disease claims are being made, then have a look at this. Below is a list of the diseases supposedly being treated by these 18 companies. It should be noted that this list could actually be expanded, but for practical purposes, some diseases have been generalized and combined. ADD/ADHD, AIDS / HIV, Allergies, Alzheimer’s disease / dementia, Anemia, Angina, Anorexia nervosa, Antimicrobial, Antipsychotic, Anxiety / nervousness, Arrhythmias, Arthritis, Asthma, Atherosclerosis, Autoimmune, Blood pressure, Brain damage, Cancer, Celiac disease, Cholesterol, Chronic fatigue syndrome, Circulation, Clotting, Cold / flu / other URI, Colitis / UC / IBD, Combats aging (implying disease), Convulsions, Cough, Crohn’s disease, Cuts / Wounds / Burns, Diabetes, Diverticulitis, Down syndrome, Dysentery, Dystonia, Earache / ear infection, Effects of alcohol, Encephalopathy, Epilepsy, Erectile dysfunction, Eye pain, Fever, Fibromyalgia, Gallstones, GERD / heartburn, Gout, H1N1, Hansen’s disease, Hashimoto’s disease, Headache / migraine, Heart diseases (other not listed), Hodgkin’s lymphoma, Hypoglycemia, Irritable bowel syndrome, Immune, Inflammation, Kidney diseases, Leprosy, Liver diseases, Lou Gehrig’s disease, Lung diseases, Lupus, Lyme disease, Malaria, Menstrual problems, Multiple sclerosis, Muscle spasms / cramps, Neuralgia /neuropathy, Osteoporosis, Pain, Parasites, Parkinson’s disease, Prostate diseases, Rheumatic fever, Sarcoidosis, Schizophrenia, Seizures, Sickle cell, Skin diseases, Sexually transmitted diseases, Sterility / Fertility, Strep throat / sore throat, Stroke, Swelling, Thalassemia, Tinnitus, Tissue repair / wound healing, Tooth disease / oral health, Tuberculosis, Ulcers, Urinary tract diseases, Vision diseases, and Wilson’s disease. Since it is generally a bad practice to point out problems without bringing some solutions, here are three quick tips you can use right now to begin cleaning up your marketing claims and hopefully avoid an FDA Warning Letter for them. Remove all explicit claims. The FDA most often points out explicit disease claims, rather than implied disease claims. If you are marketing a product in one of the nine categories listed above (cancer, inflammation, pain, etc. ), make those products your priority for cleaning up claims. Learn the codified definition of disease, as well as the criteria for structure/function claims, and refer to both frequently. Only three months into 2015, the FDA has already issued 19 Warning Letters to dietary supplement companies, seven of which cited product label violations. This is the same number of Warning Letters citing cGMP violations. Five companies were cited for both label and cGMP problems. It is not only clear that the FDA is gathering and reviewing labels during facility inspections, but also that companies continue to struggle to label their products compliantly. Statement of identity: One company did not identify their product with the term “dietary supplement” as part of a statement of identity. Net quantity of contents statement: One company neglected to include one. Another stated their net quantity of contents in U.S. Customary terms only. Supplement Facts panel (SFP): All seven companies had issues with their SFPs. These violations included: no SFP, missing or incorrect Serving Sizes and Servings Per Container, zero amount claims, missing dietary ingredients, missing plant parts for botanical ingredients, and declaring (b)(2)-dietary ingredients out of order. Ingredient statement: One company was missing ingredients in their statement. Name and place of business: One company failed to include their name and/or place of business on their label as required. Other: Two companies neglected to include a domestic address and/or domestic telephone number through which serious adverse events associated with the products could be reported. One company was using two languages on their label, but did not repeat all of the required label information in both languages. One serving of a dietary supplement equals the maximum amount recommended, as appropriate, on the label for consumption per eating occasion, or in the absence of recommendations, one unit (e.g., tablet, capsule, packet, teaspoonful, etc). If you recommend one capsule with a meal up to three times per day, your Serving Size is one capsule. If you recommend one to three capsules per day with a meal, your Serving Size is three capsules.